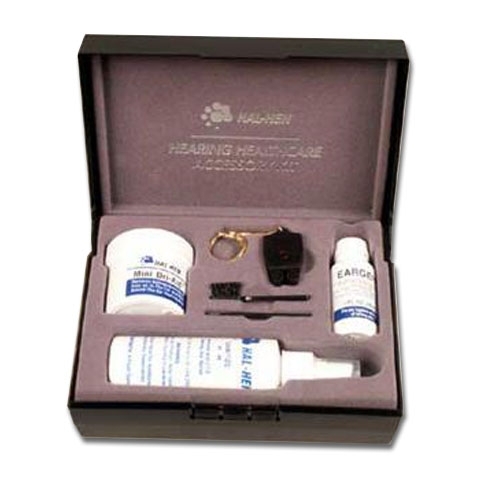 This beautifully boxed kit makes a wonderful starter kit with all the essentials for anyone wearing new hearing aids. This ear care and hearing aid care kit includes: Eargene ear cream, Mini Dri Aid, Sanitizer, Siemans pocket sized BatteryTester with key chain, wax removal tool and cleaning brush all neatly packaged in an attractive storage case. Eargene™ A must-have for ear hygiene. This soothing, refreshing ear cream is especially formulated to relieve and prevent itching and skin irritation resulting from extended wear of hearing aids. Mini Dri Aid™ Keeps hearing aids moisture free—a common problem for hearing aid wearers. Store hearing aids in moisture drying beads to keep hearing aids like new.